I had high hopes for this game. The PGA Tour Golf series had no real competition on the Genesis in the form of other golf sims, so when I saw this game on the shelf at my local game store, my interest was piqued. You can choose from 4 courses; Scotland’s famous St. Andrews , The Gauntlet Golf Club in Fredricksburg, VA, what is presumably the blue monster at the Doral Golf Resort in Miami, and Cypress Creek in Houston, TX. Like a lot of early golf titles, the game does not display the distance ranges of your clubs, but this can be overcome with practice. Instead of the 3-click system used by most games, here you hold down the A button while the power meter fills. When you let go, the meter moves back down, and you click A at just the right time for a straight shot. I like this system, and it works well in the game for longer shots. The meter fills up very quickly however, and with no way to change your shot type, short-range shots are very difficult. Without the interactive overhead map of the PGA Tour series, and with a pretty poor third-person perspective it is very difficult to accurately aim your shot. Poor ball physics also mean that what seemed like a good shot turns into a bad one when the ball bounces 15 feet in to the air after the initial landing. The game does not display a grid or matrix of arrows to show the contour of the green, instead using a little indicator to show basic green conditions. This makes putting too much of a guessing game, and it regularly takes me 3 shots on the green to get the ball in the hole. The game’s sole claim to fame is the digitized commentary during play, but if I never have to hear “ooh, can’t be too happy about that one” again in my life, I can die a happy man. The comments are few and far between, and are generally only heard when you make a mistake. Other than the sound of your swing and of the ball falling into the cup, the game is noticeably silent, with no ambient noise whatsoever. The graphics are on par with the PGA series, but there is a lot of draw-in thanks to all the trees. The clouds look cool moving across the sky, though. 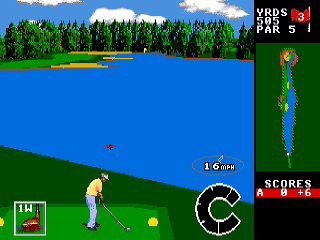 While World Class Leaderboard Golf isn’t a total failure, there is simply no reason why anyone would choose this game, easily the worst golf game I have played on the Genesis up to this point, over any of the PGA Tour titles. It isn’t terrible, but it isn’t any fun either. Buy World Class Leaderboard Golf on GameGavel or Amazon. Tagged genesis, Golf, Review, sega, Sports, World Class Leaderboard Golf. Bookmark the permalink.